We have a “Gr-Animal”. Our daughter Genette, and her husband Abe have adopted a dog. Her name is Eva Marie. Eva ended up with a middle name because Genette got annoyed with her one day and when she called her inside “Eva Marie” just slipped out. So now Eva has a middle name. Eva is a rescue and a mutt, sweet as can be, and is now being taught to come when called. Genette and Abe live in Virginia and when they come to visit they, of course, stay for a couple of days. Abe asked me if they could bring Eva with them when they came to visit. I told them it was fine but she would need to be kept on a leash when outside. We live in Charlotte and there is not only a leash law but the roads are quite busy here. Abe remembered that our backyard is fenced in on 3 sides, so he asked if it would be ok to fence in the 4th side so Eva could run around in the backyard. I told him that was fine but I wasn’t sure that we had much in the budget for that right now. He then offered a thought of building one out of recycled wood pallets. Well, I love to recycle and reuse so that was a perfect suggestion. Steven and I began to collect wood pallets. This past weekend Genette, Abe, and Eva all came to the house and the building began. 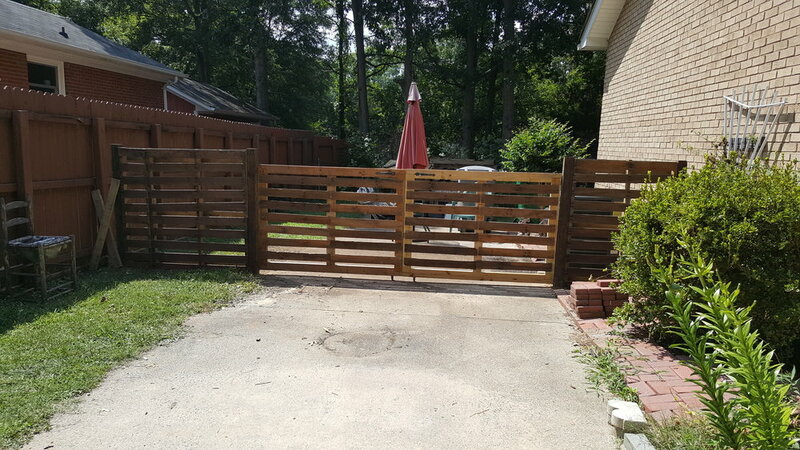 Under the fine direction of our son-in-law, a stack of wood pallets, some recycled hinges, a latch from a friend’s backyard, and less than $100 for additional supplies and tools; a fence with a double gate has been added to our landscape. I like it!! Sometime this Fall they will all be back and the second half of the fence, on the other side of the house will be built. One day I might even put it all together into a stage story! I love my garden. I would spend my entire day out there if I could. It's my sanctuary, and a place where I can release aggravations and annoyances in a very physical and creative way. Every gardener has a wishlist of "next-plant" items; I really want some milkweed in my garden for the butterflies. My sister recently gave me several seed packs of different milkweed varieties—who knew there were so many? Since it's too early to sow the seeds outdoors, I decided to start them inside. I thought you might like to see how I've planted them in my tiny, homemade greenhouse. I don’t always use things for the purpose for which they were intended. I also try to keep things out of the landfills and repurpose them whenever possible. So I'm happy when I find creative ways to solve problems using items that would otherwise be discarded. As they say, necessity is the mother of invention. SOLUTION: I pulled out an old lid I had saved from a broken crockpot and put it on the trashcan. Problem solved — the trash now stays where it belongs. 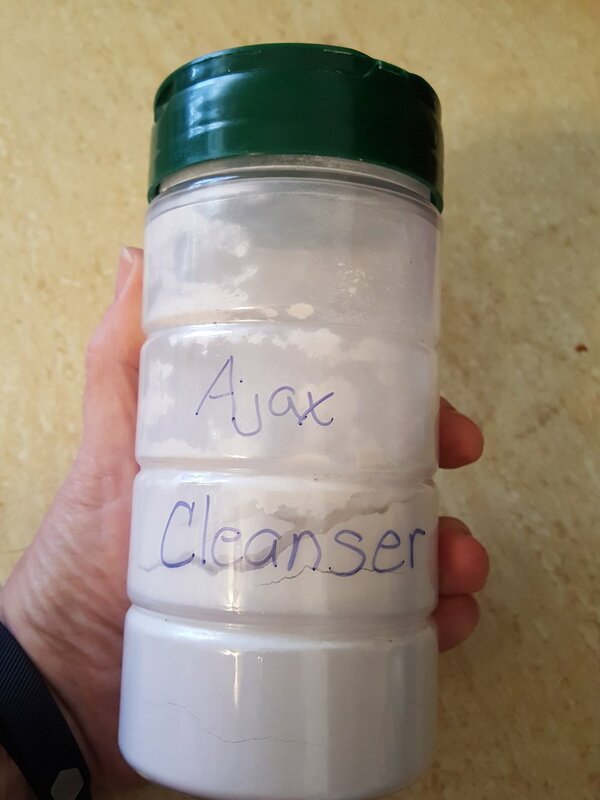 PROBLEM: I buy cleansers for cleaning which would often tip over under the sink, leaving a big mess for me to sweep up. Then the container would get wet, so I'd have to throw out the whole thing because of the moisture destroying the cardboard container and the cleanser inside. Grrrrrr. SOLUTION: The parmesan cheese you get to shake on pasta (we call it "shaky cheese" in my family) comes in a great plastic container that can be reused. I save these containers and use them for my cleanser. The lid snaps shut, the plastic does not absorb moisture and you can see the product. I use a sharpie marker to label the containers — problem solved. Those containers also work great for beads and glitter, by the way. It’s a new year, so find a new use for something you have then tell me what you did — I’d love to hear about it in the comments below! Meanwhile, get inspired by the repurposing ideas online at Upcycled Wonders and My Repurposed Life.